The EU's most comprehensive data regulation demands high standards of data handling, and affects companies worldwide. All organisations that collect personal data about EU citizens are affected by GDPR. Encryption plays an important role in safeguarding personal data. However, while GDPR states what protections must be implemented, it does not specify how. ScramFS is the critical missing link, and the ideal encryption software to assist GDPR compliance. How does GDPR view encryption? Under GDPR, encryption is seen as one of the major safeguards for protecting personal data. Various articles in the legislation make direct mention of encryption, and more generally, pseudonymisation. While we recommend that each organisation seeks legal advice based on their own circumstances, we see three specific messages relating to encryption. Encryption is specifically cited as a an appropriate technology for safeguarding data. and by ensuring ongoing confidentiality, integrity4 and availability5 of data processing systems and services. 4. Confidentiality and integrity are guaranteed by securely implemented encryption. 5. Availability is achieved via backup and disaster recovery. Encryption provides privacy by default if it is integrated into an organisation's systems and processes. Encryption is useful in mitigating against both the breach of data, and the burden of mandatory notification to both the authorities and affected individuals. Proportional fines mean that companies that handle especially sensitive data, or that have the ability to implement sound data handling practices but fail to do so, are likely to be penalised more heavily. and fines will be proportionate to the level and severity of non-compliance.2 2. According to UK ICO's blog. While GDPR tells organisations what they must do, the legislation does not cover the technical aspects of how to achieve compliance. We recognise that it can be confusing for CISOs, CTOs and CIOs to distinguish which features are necessary in an encryption system. Our analysis of past data breaches, the GDPR legislation and encryption technology in general, has narrowed down the field to 15 key requirements. What this means: whenever data is placed on storage devices and systems, it is fully encrypted so as to not leak any information. Why it’s important: all too often, access-level security measures fail to protect data. Human errors, misconfigured servers or cloud services, stolen usernames and passwords, and untrustworthy personnel can cause a security breach, meaning unauthorised people get access to your data. However, encryption is the safeguard that protects an attacker from understanding the data – because properly encrypted data is impossible to read without the encryption key. This preserves the confidentiality of the data, and stops a security breach from escalating into a data breach. What this means: a significant source of data breaches is transporting data from one person or company to another. For example, to copy data from company “A” to “B”, it is common to use an intermediate server like cloud storage, “C”. In this sequence of events, data is copied from “A” to “C”, and then from “C” to “B”. Data should be encrypted for the entire duration – that is, from “A” to “B”. Why it’s important: a common misconception is that Transport Layer Security (often referred to as TLS/SSL) is sufficient protection for data in transit. 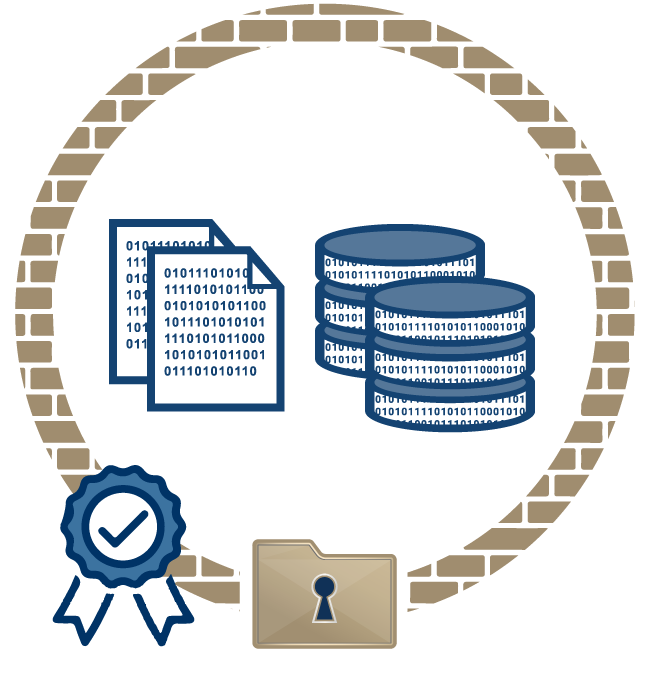 While TLS protects data as it is transported from point to point via encryption, data will be decrypted at the TLS terminator (the end-point). In the example above, data will be decrypted at “C”, meaning that the decrypted data can be breached from the cloud storage provider. This has happened numerous times in the past, including the Verizon customer data breach of October 2017. End-to-end encryption would have prevented this from occurring – if the data was encrypted at “A” and decrypted at “B”, any security breach at “C” would only have revealed encrypted data, therefore preventing the leak of information. What this means: encrypting and protecting not only file contents, but file names and directory names as well. Many encryption systems only encrypt file contents, leaving file names and directory names unencrypted – a source of data leakage. Other encryption systems only anonymise file names. Why it’s important: file names and directory names often contain sensitive information, while also giving attackers clues as to the contents of files. Further, it provides inadequate security, as attackers will be able to modify the names of files and directories, and even launch integrity attacks on encrypted file contents, where the contents of files and directories may be swapped without detection. Anonymisation techniques can also suffer from integrity attacks. What this means: all encryption is done on a device you own and control, not on the cloud provider’s. You hold your own encryption keys and the cloud provider never knows the keys. Why it’s important: to satisfy GDPR, under Article 4(5) definition of pseudonymisation, the key must be held separately to the data. It is also good security practice. if the cloud account is accidentally misconfigured to be open to the public, the server will decrypt data to everyone, rendering the entire server-side encryption worthless. This is precisely the scenario that encryption is designed to prevent. What this means: encryption and decryption is performed in real-time, “on the fly” and on demand as data is accessed. Why it’s important: manually implementing encryption is notoriously difficult and error-prone, so the best security system is one that functions automatically, behind the scenes. Simultaneously, GDPR Article 25 calls for “privacy by design and default”. A transparent encryption / decryption system makes this possible without requiring extra effort, extra hardware or re-architecting existing systems. What this means: sensitive data can come in may forms – text files, photos, videos, Office documents, PDF files. Why it’s important: encryption is a significant investment for any organisation. To simplify the job of I.T. departments, minimise the burden of key management and promote deployment, it is advantageous to use one encryption system for all types of encrypted files. Therefore, the system needs to protect and work with all sorts of files, protecting them while in use and at rest. An example is playback of an encrypted video: ideally, video playback should start instantly, and it should be possible to seek forwards and backwards in the video without having to decrypt the entire video file. What this means: your encryption system should be easy to implement, and should make it easy to add security to existing processes. For example, your nightly backups of data from your customer relationship management system that already run as unattended cron jobs should then interface nicely with your encryption system. Why it’s important: a main barrier to adopting encryption is the difficulty of implementation and the need to re-engineer or re-architect existing solutions. What this means: Your encryption system needs to support different cloud storage systems, instead of being tied-down to one specific cloud vendor. Why it’s important: over time, as your organisation changes and grows, you may need to switch cloud vendors, or switch between private cloud, hybrid cloud and public cloud. Using an encryption system provided by the cloud-vendor may lock you into using that cloud vendor indefinitely, and present high switching costs. What this means: you can copy encrypted data from one storage location to another. For example, if encrypted data is stored in on a local NTFS file system, it should be able to be copied to other local storage devices (hard drives, USB flash drives), network attached storage and iSCSI/SAN devices, no matter if they are formatted with NTFS, ext4, ZFS, or other file systems. Additionally, it should be possible to copy encrypted data to different cloud storage systems. Additionally, when you need to copy data from one cloud to another, perhaps using the cloud vendor’s migration tools, it should be possible to copy encrypted files, without needing to decrypt and re-encrypt them. Why it’s important: data may be stored on many different devices and in different places, so a universal encryption system will guarantee that encrypted data can be read and written anywhere. Additionally, it is important to prevent data leakage in migration operations. Cloud vendors offer migration tools that copy data from one place to another, but that requires granting the cloud vendor migration tool access to your cloud accounts. This provides a weak point in security: if plaintext data is migrated across, this data is exposed to the migration tool. However, if you copy encrypted data from one cloud to another, the migration tool can have access to the encrypted data and perform the migration all while being unable to read that data. What this means: a primary copy of data is the “master” version – for example, files on a file server, or data in a database. Doing this requires systems to be designed and implemented with security from the start. It is the role of software developers and architects to integrate encryption into their applications to achieve security by design and default. This also means that sensitive data (for example, biometric files) needs to be stored encrypted, often in a separate storage area to regular data. Developers should use the techniques of pseudonymisation and tokenisation to store de-identified tokens in regular databases, while those tokens can be used as reference pointers into encrypted storage. Why it’s important: in addition to satisfying GDPR Article 25, in order to mitigate against events like hacking attempts, encrypting data early and before it’s physically stored provides the best protection. This ensures that sensitive information is inherently secure from the start, so that subsequent copies are automatically safeguarded. What this means: a secondary copy of data is any additional copy such as a backup, archive, export, transfer or migration. Many cloud leaks happen when secondary copies of data are poorly secured at an access level. Encryption protects directly protects the data, regardless of how well or poorly the access level security has been implemented. Sensitive data can originate from many places, and can be stored in many places. Protecting all secondary copies means encrypting all data files and file names, no matter what type the data is (e.g. database backup, photos, videos, CSV files) and no matter where it lives (e.g. cloud storage, local storage, SANs). It is normally the responsibility of system administrators to secure secondary copies of data. For example, the RNC breach of US voter data happened because of poor security of a 3rd party contractor (a data analytics company) when an Amazon S3 buckets was left unsecured. New York’s Stewart Airport breach of confidential government files happened from data backups on a NAS device. Australia’s Red Cross Blood Bank breach of citizen data happened from a database backup that was accidentally placed on a public web server. What this means: the data you encrypt today will be safe for decades to come. With computer technology continually improving at an exponential rate, certain types of encryption will become breakable more easily than others. Why it’s important: legislation, such as the German criminal code, states that the confidentiality of data (such as medical, legal) must out-survive the patient or client. Therefore, encrypted data needs to be secure, not only now, but in the future. However, quantum computers are predicted to break most forms of encryption that is currently used – including RSA and ECC cryptosystems. This directly affects many systems that implement encryption for data-at-rest – including for example, Microsoft’s Encrypting File System (EFS). What this means: the encryption system must be designed, peer-reviewed and audited by noted experts in the field – such as cryptographers and software security specialists. they are either “snake oil products” – with inflated and unsubstantiated claims of security. This problem is compounded by the fact that it is impossible for an average I.T. professional to verify those claims, so it can be hard to distinguish real security from fakes. If a vendor does not publish designs, security reviews or audits of their system, there is a high probability that it was not designed at all, and instead implemented by developers who lack the specialised cryptography skills required to create a secure system. they encourage “placebo security” – this is when the user believes something is secure because they misunderstand the actual level of security provided. For example, full disk encryption provides guarantees of privacy, but not integrity. An attacker can steal a laptop, make modifications to the disk, and return the laptop, and yet the user will be unprotected against that. Misunderstanding the limits to the encryption system can lull a user into a false sense of security. What this means: the encryption system must be designed with the cloud in mind. The level of security provided by a cryptosystem decreases when more data is put into it. When dealing with data at the scale of the cloud, this poses challenges: with millions of people encrypting billions of files, security must still be preserved for each and every file. Why it’s important: protecting data at cloud proportions can only be done by employing advanced cryptographic techniques and careful design. If an encryption system is not designed properly, it is impossible to “add in” security at a later date. Why it’s important: many encryption systems only protect privacy, not integrity. This requires a higher level of safeguarding. For example, block-based full disk encryption and volume-based encryption do not protect against integrity attacks, and are therefore inadequate for protecting data stored in the cloud. This is no coincidence, given that ScramFS was designed specifically to address the requirements of privacy legislation such as GDPR, while also being designed to be cryptographically secure. ScramFS Command Line Interface (CLI) – allows system administrators to integrate encryption into everyday processes, such as encrypting backups, transfers, and migrations. ScramFS Application Programming Interface (API) – allows developers to integrate encryption into their applications. This is especially important in achieving Article 25 (privacy by default), as it enables developers to encrypt data as soon as it is collected and stored. ScramExplorer (GUI) - allows all users to encrypt by drag and drop, via a file system browser that's similar to Windows Explorer and Mac Finder. The first step towards implementing encryption for GDPR compliance is taking advantage of the ScramFS 30 day free trial. We usually recommend that organisations start with a proof-of-concept project to get familiar with the technology, before rolling it out further. To get started, simply go to the ScramFS Download page and follow the prompts.